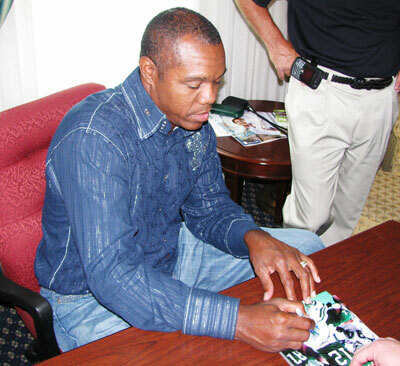 Cunningham was the Eagles second-round pick in 1985 NFL Draft . In his rookie season he played sparingly as a backup to veteran Ron Jaworski but made a big splash with his uncanny scrambling ability, in 1986, new head coach Buddy Ryan arrived in Philadelphia and made wholesale changes, many of them unorthodox. 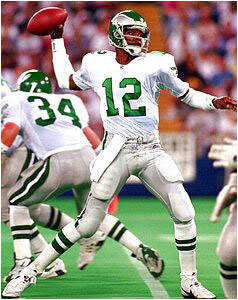 Cunningham was permanently handed the Eagles' starting job for the 1987 season. Cunningham was said to have reached "elite" status during the 1988 season, when he threw for 407 yards during the "Fog Bowl " playoff game against the Chicago Bears. Cunningham would occasionally exhibit sensational feats of athleticism, perhaps most notably in a 1988 game on Monday Night Football York Giants. Linebacker Carl Banks torpedoed in and crunched the Eagles quarterback but Cunningham managed to twist his body in midair, put a hand down for balance while parallel to the ground, regain his footing, and pass to tight end Giles for a touchdown, Cunningham uncorked a 91-yard punt, aided by a strong Meadowlands wind, on third down to clinch a key game against the Giants. The Giants. As of 2006, it is the fourth-longest punt in NFL history. Another highlight staple was in a 1990 game against the Buffalo Bills, when Cunningham, throwing from his end zone, was about to be engulfed from the blind side by Bruce Smith. Cunningham ducked under the flying tackle and heaved a pass 60 yards into the wind while off-balance on his back foot to wide-receiver Fred Barnett, resulting in an unforgettable 95-yard touchdown. That same year, Cunningham finished with 942 rushing yards, 3rd most ever for a quarterback, 10th best in the league. This nearly made him the first quarterback to both run and pass for 1,000 yards in a season). Cunningham also reached another notable milestone: 30 passing touchdowns and 942 yards rushing. Cunningham's greatest season in Minnesota and his career, was during the 1998 campaign when he guided the Vikings to a 15-1 regular season record (tied for NFL best ever since the 16 game season was initiated) with 34 touchdown passes and only 10 interceptions. Cunningham led the league with a 106.0 passer rating. In his final 10 NFL seasons, Cunningham played in only 80 games, but finished his 16-year career completing 2,429 of his 4,289 attempts for 29,997 yards and 204 touchdowns, with 134 interceptions.. Cunningham also rushed for 4,928 yards on 775 carries and 35 touchdowns. He retired after the 2001 season as the NFL's all-time leader in rushing yards and carries for the quarterback position). Cunningham then re-signed with the Philadelphia Eagles and retired for good in 2002.